So, about that Galaxy Note 9 leak: What do you think of the design? And so it begins. Some of you are probably remembering The Lord of the Rings: The Two Towers after reading those words, and they are quite fitting when it comes to Galaxy Note 9 leaks. We have seen plenty of rumors and reports about the Galaxy Note 9, and unofficial renders had also leaked out last month, giving us our first look at what the phone may look like. Samsung CEO DJ Koh offered a tantalizing teaser when he used a test version of the Galaxy Note 9 out in public, and today, the first live shots of the device have been leaked online. When such a leak comes around, it opens the floodgates for more damaging leaks in the days leading up to a new flagship’s official unveiling, ruining any surprises that the maker of the device may have been planning. We’re sure Samsung also just goes with the flow at this point, as all of its efforts to stem leaks around its flagship phones fail miserably every six months. And, for the Galaxy Note 9, perhaps the reason why DJ Koh let himself be captured using a pre-production Note 9 is because the phone is going to look pretty much the same as its predecessor. 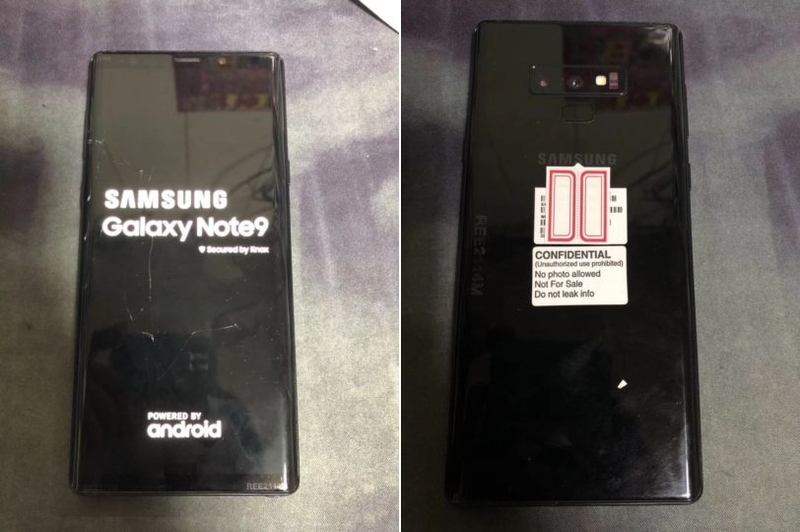 The leaked photos are the first solid proof that other than the repositioned fingerprint sensor at the back, the Note 9 and Note 8 are going to be pretty much indistinguishable as far as the design is concerned. And, frankly, with the Galaxy S10 and the first foldable Galaxy phone due next year, no one should have been expecting Samsung to shake things up. Last but not the least, there probably isn’t anything the company could do, other than bringing a notch into the equation or switching back to plastic and removable batteries, features some Samsung fans are still clinging on to (and hey, we are getting the biggest battery ever seen on a Note). What’s your take on the Note 9’s design? But that doesn’t mean everyone is going to be happy about the company keeping the Note 8 design for the Galaxy Note 9. We want to know what you think about the Note 9, now that a proper reveal has arrived. Are you okay with it looking like the Note 8, happy that at least the fingerprint sensor will be easier to reach? Or do you think Samsung could have done something to make the Note 9 stand out? Go ahead and tell us your opinion down in the comments section! I’ll not be getting this. What is the use of a pen when you can scribble at most 1-2 words next to each other? – Still the pointless edges. PLEASE make a flat top of the line model. We’ve been deprived of one since the Note 5 and that thing didn’t even came to Europe. The Note 4 is still the last proper Note. At least you could easily tell Note and S-series apart. Let it have a removable back part and battery. Well, Samsung is pretty much still using the S6 Edge design language, albeit with the current long screen fad in full use. Like I said in the previous post about the Note 9, it’s a step backwards in design when compared to the Note 8. It’s an eyesore now. Rectifying the fingerprint scanner location alone is a giant step forward. Agree! I prefere the Note8 fingerprint location. I dislike the location on S9/S9+ too and other phone’s from other manufactures. On Note8 is near the heartrate sensor where you also place the finger when measuring. Now… the locations are far away… the heartrate on one location, the fingerprint on completely different one. Bad design for me! This is just my personal preference. I find more appealing and useful on the Note8, sorry! Glad the fingerprint scanner is better placed. I hope the blue one will be available in 256gb or 512gb unlocked version in the USA on day one, in which case I’ll be pre-ordering it. The new design is cool..